(NewsUSA) - "It was 20 years ago, today…" 50 years ago actually. June 2, 2017 marked the 50th anniversary of the release of, what many describe as "the greatest rock album of all-time" -- "Sgt. Pepper's Lonely Hearts Club Band." The eighth studio album by The Beatles spent 27 weeks at the top of the U.K. charts and 15 weeks at no.1 in the U.S. This summer, Billy Shears and the gang were back on top, hitting no. 1 once again, as one of this year's highest-selling albums. Many people remember exactly where they were the first time they heard one of the iconic songs included on the album during the Summer of Love. Considering that David Bowie, Michael Jackson, Pink Floyd and many more have also been listed at the top of the charts this year, one might be inclined to dust off an old turntable or 8-track tape player. But unlike the other classic music talent mentioned, The Beatles have inspired a new revolution these days, this time for kids even younger. 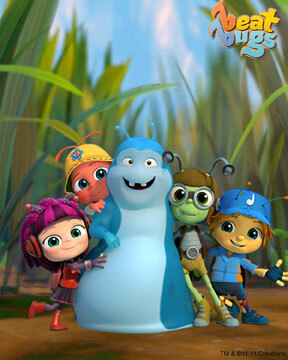 Meet Buzz, Walter, Jay, Crick, and Kumi: the Beat Bugs. Josh Wakely's Beat Bugs is an Emmy Award-winning animated kids series featuring songs made famous by The Beatles. This Netflix hit revolves around the lives and adventures of these five best friends, charming and funny childlike bugs who explore and learn life lessons in their suburban backyard home. Each episode ties in a song made famous by The Beatles, reimagined in an innocent and child-friendly fashion, sung by one of the characters or guest stars that include mega-musicians Pink ("Lucy in the Sky With Diamonds"), Sia ("Blackbird"), Aloe Blacc ("Rain"), The Shins ("The Word"), Jennifer Hudson ("I'll Follow the Sun"), and more. Beat Bugs introduces a new generation to the music of the most influential band in rock history. In support of the Netflix success, Target has curated a line ofBeat Bugs interactive merchandise, including toys and games, DVDs and books, apparel and accessories and more. Many products available come complete with the musicality of the show. From the Beat Bugs Hijinx Alive that magically sing along on cue to the show playing on Netflix or the app, to the Musical Submarine that plays excerpts from, (you guessed it) "Yellow Submarine" to the Sing Along Microphone and more. Even Beat Bugs books and the backpack play music! Shop for Beat Bugs at http://beatbugs.toys/NewsUSA. Fans "Across the Universe" have had a similar reaction to the show and the products, stating that it is such a thrill to be able to introduce The Beatles to a new generation in a refreshingly fun and innovative way. Actor, comedian, television host ("The Late Late Show with James Corden"), and singer James Corden lends his voice to "I'm a Loser" for Beat Bugs. During his recording session, he stated, "My son is four years old and I can't wait for him to watch this." "I would be amazed if he didn't just start to fall in love with these songs." So kick back, relax, and cast some special time with the kids or grandkids, who no doubt will be impressed that you already know all of the words to the songs. Fifty years from now, they'll remember being by your side the first time they heard "Sgt. Pepper's Lonely Hearts Club Band," or any other Beatles song. "Beat Bugs" features music made famous by The Beatles, reimagined for kids.